Last weekend one of my beloved friends from college, Courtney, came to Asheville to visit! Now, Courtney is a bit of a planner, so we had a strict agenda to follow. That meant that we did all the touristy things that one does (with a bit of my own input) and it was the perfect start to the season! Friday night I scooped her from the airport and we went right to the Bywater for a drink. It was dark so I don’t have a picture, but sitting by the river under the fairy lights was a pretty sweet intro to Asheville! Saturday morning we were up early for the Biltmore! It was 80 degrees at 10am and we had to wait for the shuttle in the parking lot, as the blacktop radiated heat…and it only got hotter as the day went on. Courtney also didn’t believe me that there wouldn’t be AC inside the house. I sure showed her! That afternoon we were a bit pooped from trolling the Biltmore in the heat, so we did the sensible thing and cruised the breweries. Court made it very clear that she wanted to eat (+ drink) her way through Asheville, so I did my best to show off our finest. First stop was my favorite, Burial, so that Court could get her donut beer! For dinner, we hit All Souls for their delicious pizza and then we cruised downtown to Pack Square to see the Steep Canyon Rangers play a free show at Pack Square. Sadly, Steve Martin wasn’t there but it was an awesome show and there’s always great people watching downtown. Near our house is a sweet little cider brewery that recently upgraded their patio, so we headed to Urban Orchard to czech it out, and it was awesome! They had all these ENO hammocks set up facing each other so you could lounge and chat with the person next to you. It was such a cozy and relaxing way to hang out, I know we will be back there soon. We peaced out around 10:30 since we had grand plans for Sunday and wanted to be prepared! I love having a guest that would rather get up early and explore than stay out late, since it means we get to see even more of Asheville. Sunday morning I made breakfast and we headed out for a beautiful drive on the parkway and a hike at Mount Pisgah. 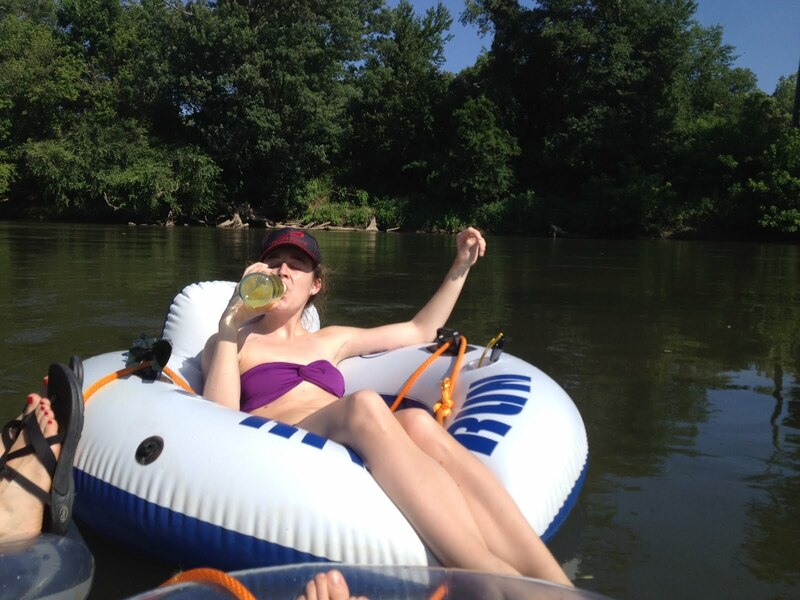 After our hike, we initiated Courtney on the dirty (French) Broad river! After washing the hike + river off of us, we had a very weird and very delicious meal of appetizers (read: bread + cheese) at the Smoky Park Supper Club, the largest shipping container restaurant in the country! Twas a long day spent in the sun and Court had a 6am flight, so dinner was the end of our shenanigans. I feel like she got such a great slice of the Asheville life: Free live music, breweries, yummy food, a hike, a drive on the parkway and a float down the river! 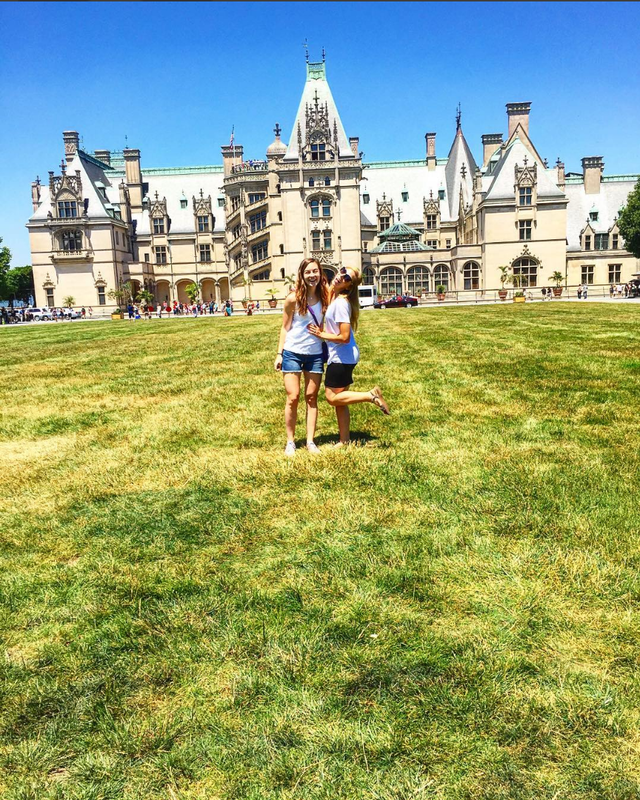 It was such a great way to start summer, and so lovely to have one of my besties in Asheville! Previous Post Tahoe + Louisa’s 2nd Birthday! This is a great venue. I was here for a party and there was so much food and it was all done so well! The decor and food at Seattle venues were amazing. Personally, I think the space is laid out really well and the size of the venue keeps pulling great parties.